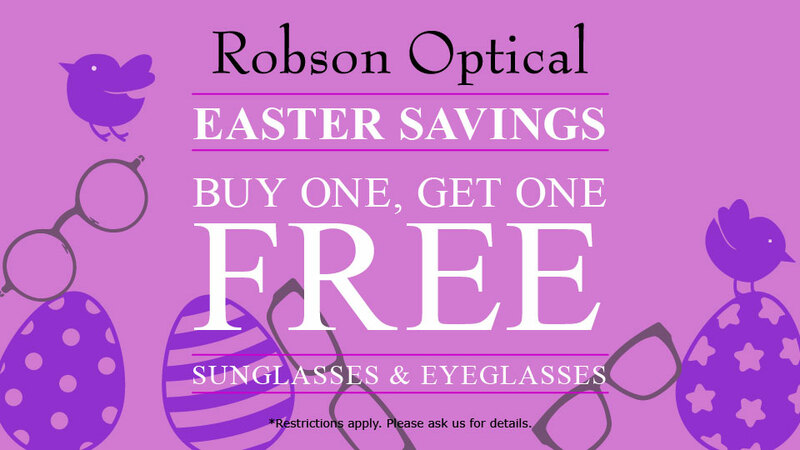 Hop in to Robson Optical and get egg-ceptional discounts on new sunglasses or prescription eyeglasses! This offer is only available until April 21st, so don’t de-lay and miss out on this eggs-ellent opportunity! Restrictions: For eyeglasses, both frame and prescriptions lenses purchase required, including single vision and progressive lenses, excluding coatings. Prescription must be the same if used on more than one pair. 1st pair is regular price, 2nd pair (equal or lesser value) is 70% off. Does not include: Add-ons (eg. hgh cyl, nylon grooving, etc. ), Contact lenses and Accessories. Brands not included: Brioni, Cartier, Dita, Elie Saab, ic! Berlin, Maui Jim, Maybach, Oakley and kids. Cannot be combined with any other offer. All sales are final, in stock items only. No rain checks. Offer expires April 21, 2019 11:59PM Pacific.